I know. I know. Should I be looking at cupcakes while I’m trying to fit into my old jeans? The answer is YES – especially if they are s’more cupcakes. Come on now! Here’s a great recipe for the holiday. Yum. Yum. and Yum. Preheat oven to 350°F (180°C). Place graham crackers into a large resealable plastic bag. Finely crush into crumbs using Baker’s Roller®;. Combine graham cracker crumbs, powdered sugar and butter in Small Batter Bowl. Using Small Scoop, place scant scoop of crumb mixture in each cup of Deluxe Mini-Muffin Pan. Press crumbs to form shallow cups with Mini-Tart Shaper. Bake 4-5 minutes or until edges are bubbling. Meanwhile, break two of the candy bars into rectangles. Remove pan from oven; place one rectangle into each cup. Break remaining candy bars and place in (1-cup/250 mL) Prep Bowl. Microwave on HIGH 1 minute-11/2 minutes or until melted and smooth, stirring every 20 seconds. Dip the top of each marshmallow in melted chocolate. Turn top-side up and let stand 40 minutes-1 hour or until set. 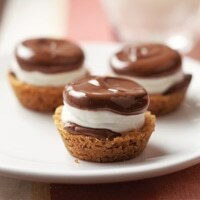 If you want something a bit easier, check out the s’mores dessert I made a few days ago. My children love cupcakes especially chocolate cupcakes. This is so easy to make. This weekend is my best friend Joe’s birthday and this is what I am planning to give him. LOL. Thanks for the recipe.